Nina Sankovitch isn't a fictional character; she is a real person within the pages of a book who I can relate to. Not necessarily for the fact that she decided to drop everything and read a book each day for a year (though that would be amazing! ), but in the way she used books to help her grieve and heal after the loss of a loved one, her sister. Her book touched me so much that I felt compelled to let her know how much I connected with her book. It's the only time I've ever emailed an author, and she wrote back with such a sweet, supportive reply. Sometimes you come across just the right book at just the right time. I wanted to take a moment to tell you how much your book touched my soul and lifted my spirit during my darkest hour. On Tuesday morning, I buried my father. After a six month battle with an incurable lung disease, the time had come to let him go. On Wednesday evening, I came across your book completely by chance. I was at the library to pick up a book I had on reserve and had promised myself that I would only check out that single book and not browse the shelves for more. Of course, being the book nerd that I am, I cannot resist the lure of an unread book. As I sat at a table flipping through a stack of books, I glanced down and noticed Tolstoy and the Purple Chair on the bottom shelf. In that moment, my only thought was that a reading book a day sounded like an interesting concept. I had no idea just how much your book would speak to me. I read the entire book in one sitting. Your words mirrored my own thoughts and feelings and made me realize that I am not alone in my grief. 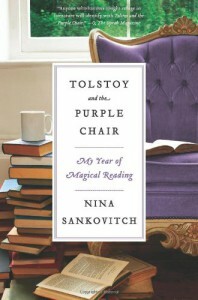 Tolstoy and the Purple Chair was the exact book that I needed to read in this moment of my life. I like to think that my heart healed a little bit with each word. "There is no void where there is memory." I will never forget those words or the way your book made me feel. Thank you.